IHE International is made up of member organizations that are stakeholders in improving the interoperability of health information systems. 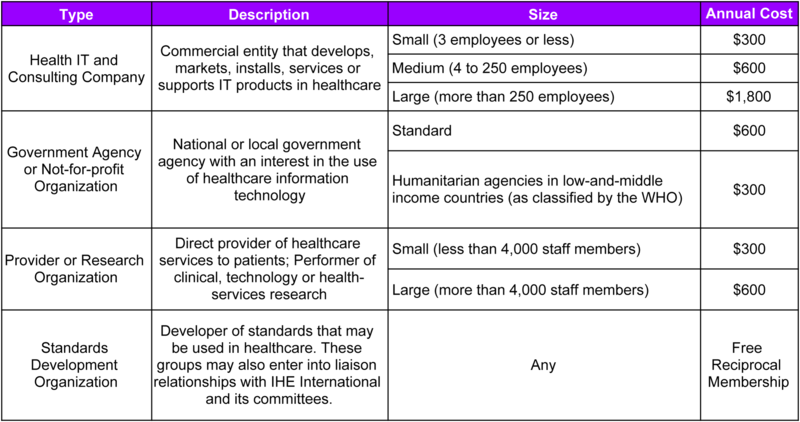 Member organizations participate in IHE in a variety of ways, including designating representatives to Domain Committees and National/Regional Deployment Committees relevant to their interests. Member organization applications will be reviewed for approval by the IHE International Board following their submission. Approved member organizations will be invoiced for their membership fees (as applicable). Activation of membership will be effective on payment of invoiced fees. Memberships run July 1 to June 30 and must be renewed annually. If you are already a member and wish to renew your membership, click here for instructions or contact membership@ihe.net for assistance.